>Angel(s) of the Lord… Finished! Nellie and Leeza were the first mother-daughter students I’ve taught… they plan to share one icon with Leeza’s grandmother in Russia and keep the other in their home here in Memphis. Ethan came by at the end of the day to watch Claire finish the icon for their baby (girl)’s nursery! Pretty amazing icon, below, left. I think a good time was had by all… they were all great students, and God blessed our time together! Some of the icons here are lying flat because they have egg washes on them and can’t be tilted until they’re dry or the egg will run. Here’s Stacey, painting the sankir (flesh) after finishing her gold leaf. Claire, Leeza and Meribeth concentrate as Kerry demonstrates how to transfer the names to the background. Today (Saturday) everyone finished the garment highlights, did the hair, and began modeling the face, creating a “mask” with “sarka,” an orange-like color. Tomorrow afternoon they will complete the face, with highlights, blending, and details on the eyes, nose and mouth. Here’s Polly, painting the angel’s names on her icon. I’m too tired to look up something to quote tonight, or even to write any more words…. a fuller report will be up by Monday… for now, enjoy the photos! Like Meribeth, who loved painting the green highlights. And Nellie, working on the names. And Emma, touching up her background. >Tonight was the beginning of the icon workshop at St. John. The students transferred the image of The Angel of the Lord to the gessoed boards, then painted the bole (clay) mixed with glue on the area where the halo will be. Kind of like the “earthy” work we have to do in our hearts in order to receive God’s “gold” … His gift of grace. Tomorrow morning the clay will be warmed up (by the students’ actual breathing on it!) to “open it” so that the gold leaf will stick. They will be gilding the halo with sheets of 23k gold leaf. That’s Meribeth and Leeza, left. Our continual mistake is that we do not concentrate upon the present day, the actual hour, of our life; we live in the past or in the future; we are continually expecting the coming of some special moment when our life will unfold itself in its full significance…. Constantly, each day, each hour, God is sending us people, circumstances, tasks, which should mark the beginning of our renewal. If we accepted every hour of our life as the hour of God’s will for us, as the decisive, most important, unique hour of our life–what sources of joy, love, strength, as yet hidden from us, would spring from the depths of our soul! I hope all my iconography students will enjoy each day of the workshop as much as we all seemed to enjoy our first session together tonight! 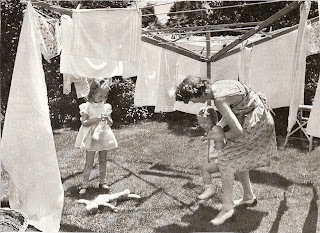 That’s Emma and Nellie, right. And Claire and Polly, below, left. And Rev. John and Kerry, right. And Stacey and Margo, below, left. Everyone did a great job! Sleep well. Tomorrow will be another day offering opportunities for joy, love and strength! >Today is the “Synaxis of the Archangel Gabriel.” In the Orthodox Church, the day following a major feast day is often dedicated to a saint (or angel) involved in the feast. In this case, today is the day after the Annunciation (of Gabriel to Mary). So… it was a good day for Kerry and me to almost finish the icon of “The Angel of the Lord” for the workshop at St. John which starts tomorrow night. And finally the details for the eyes and mouth. The almost finished icon will receive a few “life-giving lights” during the workshop. Thanks so much to Kerry, Caleb, Gabby and Sue for helping me today! The ancient style of icon-painting corresponds to ancient piety (prayer, the perception of God, and so on). This, so it seems, is why we have failed in our attempt to master the ancient style, for the form of our piety does not coincide with that which prevailed between the eleventh and the sixteenth centuries. New ventures must spring from the fullness of a new spiritual life; otherwise we shall obtain nothing genuine. Nevertheless, in so far as we are in some way leading a true spiritual life and life of prayer, it will follow the eternal pattern, such as we find in St. Paul, in Symeon the New Theologian. Therefore an icon painted according to the ancient rules, even a modest copy, serves the same purpose as the reading of the ancient ascetics—it helps us to strengthen the weakness of our spiritual life. Archangel Gabriel, pray to God for us! > Today is the Feast of The Annunciation, when we celebrate the Archangel’s Gabriel’s greeting to the Mother of God, foretelling the conception and birth, life and destiny of Jesus. Equally important, Mary accepted her role when she said, “Behold the handmaid of the Lord! Be it done to me according to Your word.” The icon of The Annunciation at left is at Holy Resurrection Orthodox Church in Clinton, Mississippi, and was done by the Russian iconographer Fr. Andrew Tregubov. Here’s part of our icon corner, with the second icon I ever painted (in 2002) of Archangel Gabriel, and the Lenten and Paschal Calendar on the wall next to it, the one Deacon James and Corinne gave us. We open a window every Sunday, revealing another icon and another step in our journey towards our celebration of the Lord’s resurrection. 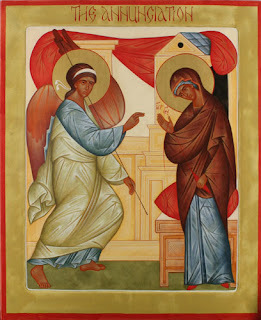 This is another icon of Gabriel (right) which was the prototype for an icon workshop I taug ht a couple of years ago. We celebrated the Feast with Divine Liturgy at St. John Orthodox Church here in midtown Memphis this morning, followed by a breakfast coffee hour. God visited us with the most perfect day: 72 degrees and sunny. After spending a morning with my brothers and sisters at St. John, I returned home to continue the work Kerry and I have been doing in preparation for the icon workshop that I’ll be teaching at St. John beginning Thursday night. Yesterday Kerry and I finished the lines and the garment highlights and the names (right). Today I did the shading and highlights on the hair (left). 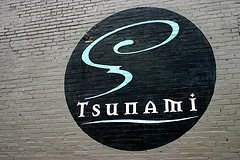 I took a break tonight to celebrate the Feast with my husband and two dear Godchildren, Damon and Madeleine, at Tsunami Restaurant in Cooper Young. We had the best sea bass I’ve ever tasted. Ever. Nice break from the Fast! Tomorrow we hope to finish the face of the icon, pack everything up, and set it up at the church, with help from a friend who will haul the heavy stuff. The workshop starts Thursday night. I’m looking forward to introducing this ancient liturgical art to a new group of students and a couple of returning ones. Stay tuned for photos of the workshop later in the week! Happy Feast! >Friends and visitors to our home often comment on the large framed print on the wall in our den. 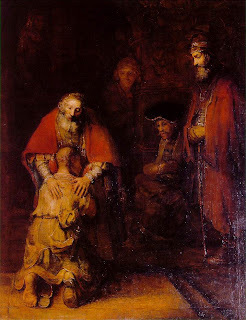 It’s a copy of Rembrandt’s famous oil painting, “The Return of the Prodigal Son.” When they ask what drew me to the painting, I tell them about Henri J. Nouwen’s book, The Return of the Prodigal Son, I read it a few years ago and was enthralled by Nouwen’s story, inspired by this painting. Every year on the Sunday of the Prodigal Son, one of the Sundays leading up to Orthodox Lent, I find myself returning home from church and meditating on this painting again. Nouwen’s book uses each of the subjects in the painting—the prodigal son, the older brother, the onlookers, the father—and parallels them to stages in a person’s spiritual growth. In the end, Nouwen says, we all need to become the father, the grownup whose forgiving arms are always open to others. Our problem is not that as children our needs were unmet, but that as adults they are still unmourned! The hurt, bereft, betrayed child is still inside of us, wanting to cry for what he missed and wanting thereby to let go of the pain and the stressful present neediness she feels in relationships…. It may take many years and just the right circumstances or person to grant us the liberating opening to know and to tell our story in words. When this happens, the memories come back and we hear ourselves putting them into words for the first time. 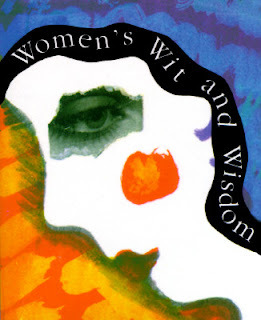 This profound release initiates us into the heavy and healing ways of grief-work…. Griefwork done with consciousness builds self-esteem sine it shows us our courageous faithfulness to the reality of loss. 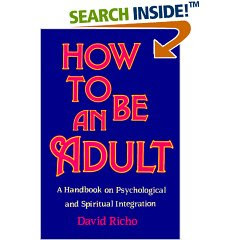 It authenticates us as adults who can say Yes to sadness, anger, and hurt. Such an heroic embrace of our own truth transforms emptiness into capacity. It’s a bit humbling to still be dealing with childhood stuff at fifty-seven…. like cutting your wisdom teeth after your own children are grown. But every two months a publication arrives in my mailbox that reminds me that I’m not alone—that an entire generation of baby boomers are also struggling with this growing up stuff. The publication is AARP The Magazine. Three stories in the March-April 2008 issue drew me in. First, probably because I’m focusing on clothes and appearance in my memoir, I loved the article, “Great Looks: 2008 Faces of 50+” and especially the story of Daisy Spears Stroud, 86 here. Mrs. Stroud, a mother, grandmother, and great-grandmother, “proves that wearing trendy clothing… can work at any age.” I also loved the story about Christine Andrews, who at 73 is part of a group that performs at local nursing homes. Click on this video (below) to watch the models talk about how they feel about “acting their age”… they’re all over 50. Okay, this next one has nothing to do with growing up, but I’m including it here just to share what looks like a great Lenten recipe – Warm Potato-Tomato Salad with Dijon Vinaigrette is here. I know I’m jumping around this morning… trying to finish my blog post before my friend Kerry arrives to continue our work preparing for the icon workshop this coming Thursday through Sunday at St. John… but I’ll end on a lighter note. I think I’ve shared before that I send an essay to the New York Times Magazine’s “Lives” column ever couple of months. A long shot, but good practice writing short essays. Usually the bio for the author includes some published works, or at least some indication of professional achievement or maturity that shows why their essay was chosen. I always read these, and usually feel better about the dozens of essays of my own that The Times has rejected. Until yesterday. When I was a girl, the glove box was a treasure chest, and its contents were a portal to a time I never knew; if I slipped on those gloves, I was elsewhere, dressed in my finest, and the posters on the wall in my room and the dolls strewn across the floor were years and miles away. My hands became her hands. That’s how I feel when I look at pictures of Mamaw and me. 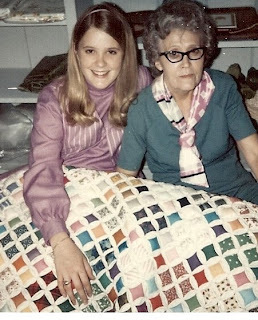 Especially this one, with the quilt she made for me as a wedding gift in 1970. (Forgive me if I posted this picture recently.) All the squares are made from scraps of dresses she sewed for me… over a period of nineteen years. I guess we all grow up on different time-scales. Celia Bell seems to be on her way, at seventeen. I’m just thankful that I can swallow my pride, learn from her, and yes, I’ll keep sending essays to the New York Times Magazine. Just for practice. >The first time I saw mothers letting their little girls wear white shoes and dresses before Easter or after Labor Day, I was scandalized. And then I realized, the mothers weren’t from the South. And some of the mothers were even breaking this sacred fashion rule themselves! 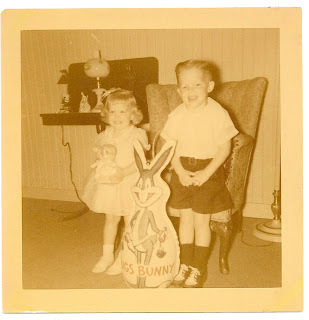 This is me and my brother, Mike, Easter 1953. I was two, and yes those shoes are white! If you’re not familiar with Orthodoxy, you might not realize that there are two dates for Easter. 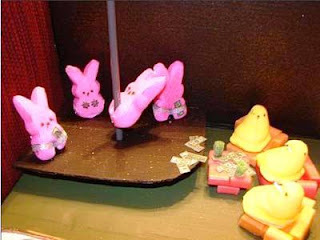 Western (primarily Catholic and Protestant) Easter is almost always earlier than Pascha, or Eastern Orthodox Easter. (Sometimes it’s the same Sunday.) This year the two feasts are a month apart, with the West celebrating this coming Sunday, March 23, and Orthodox Christians celebrating on April 27. (For links to information about the two dates for Easter, see my blog of March 9, here. My answer was that the fashion rule is attached to Western Easter, because it started in the U.S., primarily amongst Southern women, and not in a “traditional Orthodox” country. But hey! If any of my readers have new light to shed on this, leave a comment and enlighten us! 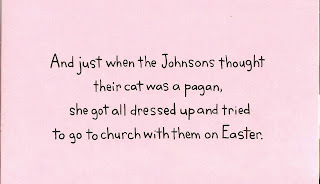 Since my mother is Presbyterian, I sent her Easter card and gift this week. 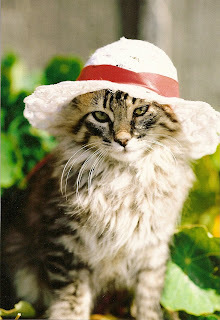 The card was perfect, because we had cats growing up. 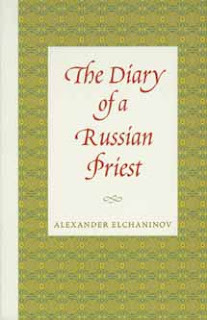 Here’s the cover, (left) and the text inside. (right) And yes, our name was Johnson. But the gift was priceless. I created my very first video of it. I’m new at saving and downloading these things, so I hope it works. First, I’ll insert a photo of Effie’s Bunny Hopper (right) and now, here comes the video. Since I’m immersed in my memoir, which uses clothes as its frame, I’ve been going through old photo albums, looking for representative pictures of fashions through the years. 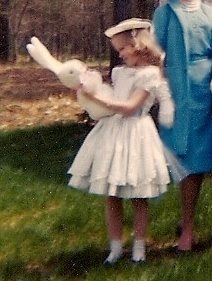 This one is from Easter 50 years ago, 1958, in Jackson, Mississippi. Get your white shoes ready, Mom! >I was having coffee with a dear friend one day last week, when she expressed a kind of restlessness, a boredom with her life. She said she wished she had something she felt passionate about, the way I feel about my writing, and painting. She’s a beautiful woman. An excellent cook. Her voice adds beauty to the music at church when she chants and sings with the choir. She’s raising talented children. She’s a faithful friend. I’ve been thinking about her words this week, and looking for something wise and encouraging to share with her. My gleanings are from diverse sources. And this picture accompanied the quote. Of course E. B. White didn’t just pick grapes and sort laundry. He wrote best-selling children’s books, like Charlotte’s Web. But he also did menial chores on his farm, so he understood about the ordinary stuff of life. And finding joy. That’s a good one for me, as I can easily fall into the trap of defining myself by what I want to be or become–like a published author–rather than by who I am. Oh, I am so inadequate–and I love myself! Last week and this, my friend and fellow iconographer, Kerry, has been helping me prepare for the icon workshop I’m teaching next week. We worked on making a sketch of the prototype and transferring the image to the gessoed board. Then we painted the bole (clay with glue mixed in) where the halo will go. Then sanded and burnished the bole and applied the gold leaf. Next we mixed the egg tempera paints (egg yolk emulsion with dry pigments) for the roskrish or base colors and applied them. We also organized paint brushes, ordered more pigments, and began to write up the class schedule and make copies of materials the students will need. Next we’ll paint the lines and highlights and details on the icons, and pack up all the supplies to take to St. John Orthodox Church where the workshop will be held. 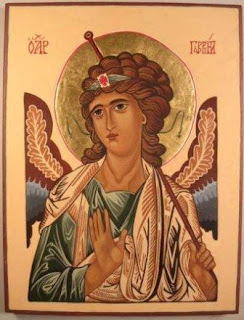 The icon the students will be painting is this one, “The Angel of the Lord.” I saw the icon at a monastery on the island of Patmos, Greece, this past October. The iconographer, Mother Olympia, was trained by Photios Kontoglou, my favorite Greek iconographer. (One of Kontoglou’s students was El Greco.) So, we’ve got a good model to imitate. If you are making something, you must call to mind the Creator of all things; if you see the light, remember the Giver of it. If you put on your clothes, recall whose gift they are and thank Him who provides for your life. In short, let every action be a cause of your remembering and praising God, and lo! You will be praying without ceasing and therein your soul will always rejoice. I love that Saint Peter doesn’t separate the spiritual from the secular aspects of our lives. That just as “making something”—writing a book, painting an icon, cooking a meal, knitting a sweater—is an opportunity to be mindful of God, so is “putting on clothes.” I don’t knit, but I love shopping and putting on clothes. So today I’m thankful for the blessing of painting icons and writing books… and wearing my new J Jill sweater. All good gifts are truly from God! Makes me think of this beautiful song , “All Good Gifts,” from the musical, “Godspell.” Enjoy!